1. Compare the pictures of the ship's masthead carvings by various artisans listed below to the portrait of Sarah Erving Waldo by Copley. What differences do you see between these two art forms? What skills are needed to be able to create each of them? How do these differences in skill create distance between the creator of each? 2. Look up the words artist and artisan in the dictionary. How do their definitions suggest important differences in the assumptions made about people who are labeled one or the other? 3. Look at the conversations that take place between Drowne and Copley. How does Copley feel about Drowne's work? Why does he see the current carving as an exception to what Drowne has done in the past? How does this reveal what Copley values in an artist? 4. Hawthorne knew that New Englanders often viewed artists with skepticism or disdain. How do the comments of townsfolk or the narrator reveal this in "Drowne's Wooden Image"? How do you think someone like Drowne or Copley might feel when hearing these things? You have just been hired as an assistant editor at Godey's Lady's Book and your boss has given you a story entitled "Alice Pyncheon" that has been submitted for publication by an unknown author named Holgrave. You must decide whether his story is appropriate for your magazine. You decide to look at some other issues of Godey's to help you decide how to respond to Holgrave's work. Based on what you see in these other issues, what will you tell Holgrave? What suggestions might you make so that his story "fits" your publication? How does his story compare to those that are published in the issues you examine? As a writer as well as photographer, Holgrave must make notes about what he sees and hears in the house of the seven gables, especially as he encounters the other characters. 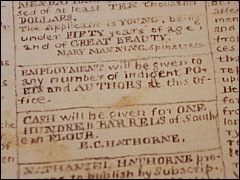 Hawthorne never allows the reader to see Holgrave's notebook. Pretend that you are Holgrave and write some sample entries for his writer's notebook. You might wish to record his impressions of Phoebe or of Hepzibah or of Clifford. You might also write about how he views the house itself, or what he sees in the garden, or what he thinks of Uncle Venner. You might even want to record some entries that reveal how he feels about himself and the way he has concealed his true identity. Use the selections that appear in the Resources: Related Literature section to provide you with some details for your writing. Before photography was widely accepted, people thought that it might be "the devil's work" or in some way related to supernatural powers (visit http://www.eyeconart.net/history/photography.htm for further information). Why might this make photography an appropriate art for Holgrave to practice? What does he reveal about photography or daguerreotypes that suggest that the process does have an unexplained power in capturing people's characters as well as their likenesses? To see examples of daguerreotypes visit http://www.photographymuseum.com/sandh1.html for examples of those made in Boston during Hawthorne's day. What might you guess about the people whose portraits you see? There it stood--poor devil of a contrivance that it was!--with only the thinnest vesture of human similitude about it, through which was evident the stiff, ricketty, incongruous, faded, tattered, good-for-nothing patchwork of its substance, ready to sink in a heap upon the floor, as conscious of its own unworthiness to be erect. Shall I confess the truth? At its present point of vivification, the scarecrow reminds me of some of the lukewarm and abortive characters, composed of heterogeneous materials, used for the thousandth time, and never worth using, with which romance-writers (and myself, no doubt, among the rest) have so over-peopled the world of fiction. Take the three passages together and first articulate what they say about the experience of artistic creation. Next, explore as completely as you can Hawthorne's personal and self-conscious reflections on the place of the artist in the world and the legitimacy of his work.